"RG3" redirects here. For other uses, see RG3 (disambiguation). Griffin was born in Okinawa, Japan, where his parents, Robert Jr. and Jacqueline, both U.S. Army sergeants, were stationed. The family later lived at Fort Lewis near Tacoma, Washington, and then moved to New Orleans, Louisiana. They finally settled in Copperas Cove, Texas in 1997 after retiring from the military. Griffin's paternal grandfather, Robert Griffin Sr., was a foreman for a New Orleans construction company. He suffered from glaucoma for several years, and died in 1984 at age 43 from a brain aneurysm. Financial hardship caused the family to move to the Desire Projects neighborhood. Griffin's father was a basketball player at Kennedy High School and enlisted in the Army before he graduated. He met his wife Jacqueline (née Ross) while stationed in Fort Carson, Colorado. In track, Griffin broke state records for the 110-meter and 300-meter hurdles. He ran the 110-meter hurdles in 13.55 seconds and the 300-meter hurdles in 35.33 seconds. The 300 hurdles time was 1/100th of a second short of tying the national high school record at the time. He was also a gold medalist in the 110- and 400-meter hurdles on the AAU track and field circuit. In 2007, as a junior, he was rated the No. 1 high school 400-meter intermediate hurdler in the country, and was tied at No. 1 for the 110-meter sprint hurdler in the nation. His personal best in the 110-meter hurdles, 13.46 sec, ranked fifth in the world among junior athletes in 2007 (behind Noga, Brathwaite, Dutch, and Vladimir Zhukov), while his best 2007 time in the 400-meter hurdles, 49.56 sec—his personal best until 2008—led all juniors worldwide for that year. Also as a junior, Griffin received the Gatorade Texas Boys Track and Field Athlete of the Year award, and was named to USA Today′s 2007 All-USA Track and Field team. His personal best in the 400-meter hurdles was achieved on May 18, 2008, with a time of 49.22 seconds. Rivals.com, a college football recruiting service, ranked Griffin the fourth-best dual-threat quarterback in the nation and the 42nd-best player in Texas in the high school prospect class of 2008. During the college recruiting period, Griffin was pursued by Stanford, Tennessee, Kansas, Nebraska, Houston, Tulsa, Illinois, Washington State, and Oregon. Griffin initially committed to play for Houston under head coach Art Briles. When Briles left Houston to take the head coaching position at Baylor, Griffin switched his commitment and eventually signed a letter of intent to play for Baylor, in part because the university also had a top track and field program. "Baylor Football Commitments". Rivals.com. Retrieved December 14, 2011. "2008 Baylor Football Commits". Scout.com. Retrieved December 14, 2011. Griffin graduated from high school a semester early, after serving as class president and ranking seventh in his class. He began attending Baylor University during the spring 2008 semester when he was 17 years old. As a member of Baylor's track and field team, Griffin finished in first place in the 400-meter hurdles at both the Big 12 Conference Championship and the NCAA Midwest Regional Championship meets; he also broke the NCAA Midwest Regional 400-meter hurdles record. He placed third in the NCAA meet and also participated in the U.S. Olympic Trials, in which he advanced to the semifinals. Griffin graduated in three years with a bachelor's degree in political science and a 3.67 GPA, while appearing on the dean's list twice. During his final year of college sports eligibility, he was studying for a master's degree in communications. As a true freshman playing for the Bears, Griffin earned Big 12 Conference Offensive Freshman of the Year honors. He started 11 of 12 games his freshman season. He made his collegiate debut in a loss to Wake Forest, where he was 11 of 19 for 125 passing yards and had 29 rushing yards and a rushing touchdown. In the upset 41–21 victory over the Texas A&M Aggies, he recorded 13 of 23 passes for 241 yards, 2 touchdowns, no interceptions, and no sacks. Griffin garnered Big 12 Freshman of the Year honors from the league's coaches (who are not allowed to vote for their own players) as well as the media. The team finished the season with a 4–8 record (2–6 Big 12). Griffin sat out for the remainder of the 2009 season after sustaining an isolated tear to his ACL in the first half of the third game, his third start of his sophomore year. The Bears picked up a 68–13 victory over Northwestern State. Baylor finished the season with a 4–8 record (1–7 Big 12). Griffin was granted redshirt status so he entered the 2010 season as a sophomore. According to the bylaws, players who are injured after playing less than 30 percent of the season may be eligible (Griffin was injured during the third game of the 2009 season, with 25 percent of the season completed). Overall, he finished the season with 3,501 passing yards, 22 passing touchdowns, eight interceptions, and had 149 rushes for 635 rushing yards and eight rushing touchdowns. Baylor finished the season with a 7–6 record (4–4 Big 12). Coming into the 2011 season, the Baylor Bears were not expected to do well, being picked 6th in the Big 12 preseason poll. The Bears opened the season against 15th-ranked TCU. The Bears took a 47–23 lead into the 4th quarter, and were able to fight off a comeback after the Horned Frogs gained the lead 48–47 briefly, only for Baylor to kick the game-winning field goal and win 50–48. They pulled off the upset in large part due to Griffin's performance; he passed for 359 yards, with 5 touchdowns and a 77.8% completion percentage. On the game-winning drive, Griffin also caught a key pass. Following the win, Baylor entered the AP Poll rankings for only the third time in the previous 15 seasons, at 20th, and Griffin was considered by many to be a Heisman Trophy candidate. After a bye week, Baylor shut out Stephen F. Austin State University 48–0, and Griffin went 20 of 22 (90.9%) for 247 yards and 3 touchdowns and ran for 78 yards. In week 4, Griffin ushered Baylor to their third win, beating Rice University 56–31; Griffin completed 29 of 33 passes (87.9%) for 338 yards with 51 yards rushing and a touchdown. In week five against Kansas State, Griffin almost brought the Bears to their fourth win, going 23 out of 31 (74.2%) for 346 yards and 5 touchdowns with only 1 interception, but they lost 36–35 to the Wildcats. In week six against Iowa State, Griffin took Baylor to Iowa for their fourth win, completing 22 out of 30 (73.3%) for 212 yards, 1 touchdown, and no interceptions. He won the Heisman Trophy, becoming the first player from Baylor to win it. Griffin also led Baylor to a 10–3 record, including a 67–56 win over the Washington Huskies in the Alamo Bowl. With a combined 123 points, it stands as the highest-scoring regulation bowl game in NCAA history. Due to the Alamo Bowl, Griffin became the first player since Tim Tebow in 2007 to win the Heisman and not appear in the National Championship (#1 LSU faced #2 Alabama). Overall, he finished the 2011 season with 4,293 passing yards, 37 passing touchdowns, and six interceptions to go along with 179 rushes for 699 rushing yards and ten rushing touchdowns. Griffin, who graduated with a Bachelor of Arts degree in political science with a 3.67 grade point average in December 2010, began pursuing a Master's in communications in 2011. On January 11, 2012, Griffin officially announced his intention to enter the 2012 NFL Draft. Griffin sat out for the remainder of the 2009 season after sustaining an isolated tear to his ACL in the first half of the third game and his third start of his sophomore year. In 2009, Griffin had 1 punt for 59 Yards. In 2011, Griffin had 3 punts for a total of 99 yards, the longest was 39 yards. Griffin set or tied 8 single-game, 26 single-season, and 20 career Baylor records. 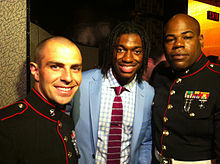 Griffin (center) posing with two marines at the 2012 NFL draft. Griffin was not perceived as a first-round draft pick prior to his junior season. By midseason, however, he had drawn the attention of NFL scouts and analysts, and some started projecting he would be an early first round selection. Towards the end of his junior season, Griffin had established himself as the No. 2 quarterback prospect for the 2012 NFL Draft, behind the unanimous first pick projection Andrew Luck. Griffin was widely projected to be the No. 2 pick of the draft, but the St. Louis Rams—the team originally holding the pick—had already selected Sam Bradford to be their long-term starting quarterback with the No. 1 overall pick in the 2010 NFL Draft. Wanting to stick with Bradford, the Rams decided to deal the pick prior to the draft, with the Cleveland Browns and Washington Redskins perceived as the most interested bidders. After a brief bidding process, the Redskins acquired the pick by giving the Rams four high-value draft picks over three years: their first-round picks in 2012 (No.6 overall), 2013 (No.22 overall), and 2014 (No.2 overall), as well as their second-round pick (No.39 overall) in 2012. As expected, the Redskins selected Griffin with the second overall pick, making him the second Baylor Bear to be drafted that high in four years (after Jason Smith in 2009), but the first Baylor quarterback to be chosen second overall since Adrian Burk in 1950. Griffin wore number 10 for the Redskins, with "Griffin III" on the back of his jersey. This made him the first player in the history of the "Big Four" professional sports leagues (NFL, MLB, NHL, and NBA) to have a Roman numeral on the back of his jersey, as the NFL changed the rule in 2012 to allow players to include generational titles in their names. Griffin previously had "Griffin III" on the back of his jersey while in college, which was actually necessary in order to distinguish him from the other Robert Griffin on the Baylor team. On July 18, 2012, the Redskins officially signed him to a four-year, $21.1 million contract with a $13.8 million signing bonus. On September 9, 2012, Griffin officially became the NFL's first starting quarterback who was born in the 1990s. In his official debut as a starting quarterback in the NFL, Griffin opened the Redskins' season by completing 19 of 26 passes for 320 yards and 2 touchdowns while adding 10 carries for 42 rushing yards in a 40–32 victory over the New Orleans Saints. He was named NFC Offensive Player of the Week for his performance – the first time in NFL history that a rookie quarterback has been given that honor for his debut game. Griffin's debut performance was further rewarded after he was named NFL Rookie of the Week, and he was given that honor once again after the Redskins' win over the Tampa Bay Buccaneers in Week 4. On October 4, he was named September's NFL Offensive Rookie of the Month. The next week against the Atlanta Falcons, he left the game late in the third quarter after suffering a mild concussion after receiving a blow to the head by Sean Weatherspoon. He was cleared to play in the next game against the Minnesota Vikings, where he had another impressive performance that included a 76-yard rushing touchdown. The Redskins ended their home-game losing streak and Griffin was named NFL Rookie of the Week for a third time. On November 14 during the Redskins' bye week, the team voted Griffin an offensive co-captain. Following the Redskins' 31–6 victory against the Philadelphia Eagles, he was named NFC Offensive Player of the Week for a second time. Griffin's performance – passing for 200 yards with 4 touchdowns, rushing for an additional 84 yards, and finishing with a perfect 158.3 passer rating – made him the first rookie in NFL history to pass for 200 yards, pass for 4 touchdowns and rush for more than 75 yards in a single game. Along with that achievement, his performance against the Eagles made him the youngest player in NFL history, at 22 years and 284 days old, to achieve a perfect passer rating in a game. This record stood until 2015, when Tennessee Titans quarterback Marcus Mariota threw for a perfect passer rating at 21 years and 318 days old in his debut. In the Week 14 game against the Baltimore Ravens on December 9, the Redskins would suffer another injury scare when defensive end Haloti Ngata hit Griffin directly at his right knee, twisting it in the process. On the final drive of the fourth quarter, Griffin was tackled after rushing for 13 yards and hopped on one leg for several plays before leaving the game. Backup quarterback Kirk Cousins would come in the game and lead the Redskins to a 31–28, overtime victory. The next day it was confirmed that Griffin had sustained a Grade 1 LCL sprain. It was decided that Griffin would sit out the next game against the Cleveland Browns to give him more time to heal and avoid the chance of further injuries. He returned the next game and led the Redskins to another victory over the Eagles in Week 16. The knee injury emerged as a controversy on January 6, the day the Redskins faced the Seattle Seahawks in the NFC wild card game, when USA Today reported that – contrary to a previous statement made by head coach Mike Shanahan – Dr. James Andrews had not cleared Griffin to return for the post-injury plays in the December 9 game. Griffin then re-injured his knee in the wild card loss to the Seahawks. Griffin underwent surgery on January 9 and both his LCL and ACL were repaired. For the season, Griffin set records for highest passer rating by a rookie quarterback (102.4) and highest touchdown to interception ratio (4:1) (both since broken by Dak Prescott). Aside from the week 15 game against the Cleveland Browns where he did not play, Griffin played a vital role in helping the Redskins finish the regular season on a 7-game winning streak after starting the season 3–6, leading the team to its first playoff appearance since the 2007 season. On December 26, Griffin was named to enter the 2013 Pro Bowl in recognition of his successful rookie season. Due to injuries on his ACL and LCL ligaments in his right knee, he was negated from the Pro Bowl roster and replaced by Drew Brees. Griffin also won the 2012 NFL Offensive Rookie of the Year award. After some controversy over whether Griffin would be ready for the season opener (he did not play a single preseason game), he debuted in the loss to Philadelphia Eagles. Griffin failed to replicate his 2012 success during the first half of the 2013 season and remained statistically below expectations until Washington's Week 7 game against the Chicago Bears. Leading the Redskins to a 45–41 victory, Griffin recorded 298 passing yards and two touchdowns, including a 45-yard touchdown pass to Aldrick Robinson. The Redskins' 27–6 loss against the San Francisco 49ers in Week 12 was the first game in Griffin's collegiate and professional career where he failed to score a single offensive touchdown. On December 11, head coach Mike Shanahan announced that Griffin would be inactive for last three games of the season and that Kirk Cousins would finish the season as the starter. He claimed that it was done in order to eliminate risk of further injury to Griffin. He finished the 2013 season with 3,203 passing yards, 16 passing touchdowns, and 12 interceptions to go along with 86 carries for 489 rushing yards and a rushing touchdown. On September 14, 2014, in Week 2, against the Jacksonville Jaguars, Griffin was carted off the field after suffering a dislocated left ankle. X-rays and MRIs revealed no fractures in the ankle. On October 29, it was reported that Griffin was set to return against the Minnesota Vikings in week 9. The Redskins then dropped their next three games, falling to the Vikings, Buccaneers, and 49ers. On November 25, it was reported that Griffin would be benched for Colt McCoy, heading into Sunday's game against the Indianapolis Colts. After McCoy went down with a neck injury against the New York Giants, Griffin came in and looked impressive in a loss to the Giants, throwing for 236 yards and 1 touchdown passing. Griffin was named the starter for the rest of the year when the Redskins put Colt McCoy on injured reserve. Griffin responded to that with a winning performance in a 27–24 victory over the Eagles. He threw for 220 yards and had one interception. In the final game of the year against the Cowboys, Griffin showed strides of his rookie year. He threw for a season-high 336 yards and had 2 touchdowns (one passing, one rushing) in a 44–17 loss. Griffin was 2–5 as a starter in 2014 and the Redskins finished 4–12 and last place in the NFC East. During Week 2 of preseason in a win over the Detroit Lions, Griffin fumbled the ball and recovered it but had a defensive lineman fall on top of him. Griffin suffered a concussion in the process and was questionable for the next game against the Ravens. Griffin was medically cleared for the game by a physician, but a few days later the same physician declared Griffin not ready for the game, thus giving backup Kirk Cousins the start. After the win over the Ravens, Cousins was named the starter for the regular season opener and onward. On September 13, 2015, it was reported that Griffin was practicing as a safety with the scout team. He ended up third on the quarterback depth chart, behind Cousins and Colt McCoy, and remained inactive for the entire regular season. On March 7, 2016, Griffin was released by the Redskins. On March 24, 2016, Griffin signed a two-year, $15 million contract with the Cleveland Browns. On August 8, 2016, Browns head coach Hue Jackson named Griffin the team's starting quarterback for the 2016 season. Griffin was placed on injured reserve on September 12, after suffering a shoulder injury in the Browns' season opening loss to the Philadelphia Eagles. He was activated off injured reserve on December 9, 2016, prior to Week 14 against the Bengals. Griffin played in five games, all starts, in 2016, completing 87-of-147 passes for 886 yards with two touchdowns and three interceptions. He also rushed for 190 yards and two touchdowns. On March 10, 2017, Griffin was released by the Browns. On April 4, 2018, Griffin signed a one-year contract with the Baltimore Ravens. On September 2, 2018, Griffin was named the team's backup quarterback. Backing up Joe Flacco and Lamar Jackson, Griffin appeared in three games in the 2018 season. On March 21, 2019, Griffin re-signed with the Ravens on a two-year contract. Griffin began dating fellow Baylor student Rebecca Liddicoat in 2009, and the two were married on July 6, 2013. Rebecca gave birth to Griffin's first child, a daughter in 2015. On August 16, 2016, it was reported that Griffin and his wife were separated and in the process of filing for divorce. In August 2016, Griffin and Estonian heptathlete Grete Šadeiko became romantically linked. They were engaged on May 13, 2017. In 2017, Griffin announced via Instagram the birth of his second daughter. The couple married on March 10, 2018. Griffin grew up a fan of the Denver Broncos and Mike Shanahan, whom he played under for his first two seasons with the Redskins. Griffin is a Protestant Christian, and has said his relationship with God is his "most important influence." Before the start of his rookie season with the Redskins, Griffin had signed a number of endorsement deals from companies such as Adidas, Castrol Motor Oil, EA Sports, EvoShield, Gatorade, Nissan, and Subway. According to ESPN's Dollars blog, Griffin had "earned more than any other rookie in NFL history before throwing his first regular-season pass," largely as a result of endorsements. ^ a b c "The Mag: The legacy of RG3". ^ "Robert Griffin III: Poised to handle the pressure". 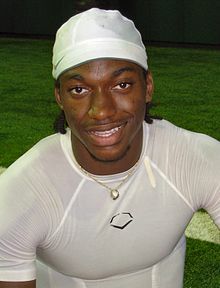 ^ a b "NFL draft: Robert Griffin III and family ties from New Orleans are poised to celebrate". ^ "Robert Griffin III Foundation » ROBERT GRIFFIN III". rg3foundation.org. Retrieved March 2, 2018. ^ a b "Robert Griffin – Baylor Bears bio". Archived from the original on October 17, 2008. ^ a b "110 m Hurdles (99.0cm) – men – junior – outdoor – 2007 – iaaf.org". iaaf.org. Retrieved September 16, 2015. ^ "400 Metres Hurdles – men – junior – outdoor – 2007 – iaaf.org". iaaf.org. Retrieved September 16, 2015. ^ "2007 Boys All-USA Track and Field team". USA Today. July 25, 2007. ^ a b "400 Metres Hurdles – men – junior – outdoor – 2008 – iaaf.org". iaaf.org. Retrieved September 16, 2015. ^ "UIL Track Championships - Results (Raw)". Texas MileSplit. May 11, 2017. Retrieved August 4, 2018. ^ "Big 12 Roundup: Bearing down, Buffalo stampede and more". ^ a b c Jenkins, Sally (March 11, 2012). "Robert Griffin III: His military appreciation will play well in the NFL and would benefit the Redskins". Washington Post. Retrieved March 17, 2012. ^ "Academic All-Americans RG3 & Luck Among Heisman Finalists – Baylor Bears Official Athletic Site". BaylorBears.com. December 9, 2011. Retrieved May 11, 2013. ^ "EA Announces Robert Griffin III as NCAA Football 13 Cover Athlete". Business Wire. Retrieved March 2, 2018. ^ "Wake Forest at Baylor Box Score, August 28, 2008". College Football at Sports-Reference.com. Retrieved March 2, 2018. ^ "Texas A&M at Baylor Box Score, November 15, 2008". College Football at Sports-Reference.com. Retrieved March 2, 2018. ^ "Robert Griffin #10 QB". ^ "2008 Baylor Bears Schedule and Results". College Football at Sports-Reference.com. Retrieved March 2, 2018. ^ "Baylor QB Griffin Out for Season". ^ "Northwestern State at Baylor Box Score, September 26, 2009". College Football at Sports-Reference.com. Retrieved March 2, 2018. ^ "2009 Baylor Bears Schedule and Results". College Football at Sports-Reference.com. Retrieved March 2, 2018. ^ "Robert Griffin III 2010 Game Log". College Football at Sports-Reference.com. Retrieved March 2, 2018. ^ "2010 Baylor Bears Schedule and Results". College Football at Sports-Reference.com. Retrieved March 2, 2018. ^ "Big 12 Announces Media Preseason Football Poll". Big 12 official website. ^ "Texas Christian at Baylor Box Score, September 2, 2011". College Football at Sports-Reference.com. Retrieved March 2, 2018. ^ "Baylor Bears AP Poll History". sports-reference.com. Archived from the original on September 25, 2011. ^ "2011 Week 2 College Football Rankings". Espn.com. ^ "ESPN Heisman watch". ESPN.com. ^ "No. 19 Baylor beats SFA 48-0 in shortened game – College Football – Rivals.com". Rivals.yahoo.com. Retrieved May 11, 2013. ^ "Stephen F. Austin at Baylor Box Score, September 17, 2011". College Football at Sports-Reference.com. Retrieved March 2, 2018. ^ "Griffin carries No. 17 Baylor past Rice 56-31". Rivals.yahoo.com. Retrieved May 11, 2013. ^ "Rice at Baylor Box Score, September 24, 2011". College Football at Sports-Reference.com. Retrieved March 2, 2018. ^ "Baylor at Kansas State Box Score, October 1, 2011". College Football at Sports-Reference.com. Retrieved March 2, 2018. ^ "Iowa State at Baylor Box Score, October 8, 2011". College Football at Sports-Reference.com. Retrieved March 2, 2018. ^ "2011 Heisman Trophy Voting". College Football at Sports-Reference.com. Retrieved March 2, 2018. ^ "Alamo Bowl - Washington vs Baylor Box Score, December 29, 2011". College Football at Sports-Reference.com. Retrieved March 2, 2018. ^ "2011 Baylor Bears Schedule and Results". College Football at Sports-Reference.com. Retrieved March 2, 2018. ^ "Robert Griffin III 2011 Game Log". College Football at Sports-Reference.com. Retrieved March 2, 2018. ^ "Robert Griffin – Academics". ^ "U.S. House Resolution Honors Heisman Winner Robert Griffin III – KWTX.com". KWTX. Archived from the original on December 5, 2014. Retrieved November 27, 2014. ^ "Heisman winner Griffin leaves Baylor to enter NFL draft". CNN. January 11, 2012. ^ "Dallas Morning News' All-Big 12 Team". ^ "2008 TRIBUNE-HERALD ALL-BIG 12 FOOTBALL TEAM: It's all about offense". Archived from the original on December 10, 2008. ^ "Griffin, Charbonnet and Wolfert Named Big 12 Football Players of the Week". ^ "Sporting News' college football All-Freshman Team". Archived from the original on April 18, 2009. ^ "Rivals.com 2008 Freshman All-America Teams". Archived from the original on June 4, 2009. ^ "Robert Griffin III". Baylor Athletics. Archived from the original on October 28, 2012. Retrieved August 23, 2012. ^ a b "Griffin, Charbonnet and Wolfert Named Big 12 Football Players of the Week". Big 12 Conference. September 15, 2008. Retrieved August 23, 2012. ^ "NFL Combine profile for Robert Griffin III". NFL.com. Retrieved May 11, 2013. ^ "2012 Combine workout: Robert Griffin III – NFL.com Video". NFL.com. Retrieved November 27, 2014. ^ Schrager, Peter (November 15, 2011). "Midseason 2012 NFL Mock Draft". FoxSports.com. ^ Schefter, Adam (March 12, 2012). "Washington Redskins acquire No. 2 overall pick from St. Louis Rams". ESPN. Archived from the original on November 23, 2012. "In order to execute each of our club's plans for free agency and the upcoming draft, we have agreed to a trade between our two teams for the 2nd pick in the 2012 draft. We will submit this trade to the NFL for approval," Redskins general manager Bruce Allen and Rams general manager Les Snead said in a combined statement Saturday morning. ^ "Robert Griffin III headed to NFL". ESPN.com. January 12, 2012. Retrieved January 16, 2012. ^ "2012 NFL Draft Listing". Pro-Football-Reference.com. Retrieved March 2, 2018. ^ "Baylor Bears Draft History". Pro-Football-Reference.com. Retrieved March 2, 2018. ^ "Baylor Bears QBs Chosen Second Overall In The NFL Draft". Pro-Football-Reference.com. Retrieved March 2, 2018. ^ Lukas, Paul (May 24, 2012). "Robert Griffin III's historic Roman conquest". ESPN. ^ Jones, Mike (July 18, 2012). "Quarterback Robert Griffin III signs four-year, $21 million contract with Redskins". WashingtonPost.com. ^ Graziano, Dan (September 12, 2012). "Here's a whole bunch of stuff about RG3". ESPN.com. ^ Banks, Don (September 9, 2012). "RGIII delivers on hype, and more, in starry debut win over Saints". ESPN.com. ^ Tinsman, Brian (September 12, 2012). "Griffin III The NFC Offensive Player Of Week". Redskins.com. Archived from the original on April 26, 2016. ^ "As Offensive Player of the Week, Griffin Provides a First". New York Times. The Associated Press. September 12, 2012. ^ Tinsman, Brian (September 14, 2012). "Griffin III Wins Two More NFL Week 1 Awards". Redskins.com. Archived from the original on April 26, 2016. ^ Tinsman, Brian (October 5, 2012). "Griffin III Wins NFL Rookie Of The Week". Redskins.com. Archived from the original on April 26, 2016. ^ Tinsman, Brian (October 4, 2012). "Griffin III The NFL Offensive Rookie Of Month". Redskins.com. Archived from the original on April 26, 2016. ^ Rosenthal, Gregg (October 7, 2012). "Robert Griffin III had mild concussion in Redskins' loss". NFL.com. ^ Tinsman, Brian (October 14, 2012). "Redskins Seize First Home Win: 38–26". Redskins.com. Archived from the original on April 26, 2016. ^ Tinsman, Brian (October 14, 2012). "Griffin III Rookie Of The Week Nominee". Redskins.com. Archived from the original on April 26, 2016. ^ Brian, Tinsman (November 14, 2012). "Griffin III Among 2012 Team-Elected Captains". Redskins.com. Archived from the original on November 7, 2017. ^ Tinsman, Brian (November 21, 2012). "Second Award For Griffin III Is An NFL First". Redskins.com. Archived from the original on November 7, 2017. ^ Tinsman, Brian (November 20, 2012). "Griffin III Nominated For Top NFL Honors". Redskins.com. Archived from the original on April 26, 2016. ^ "Top rookie quarterbacks of all-time". Times Colonist. Retrieved March 2, 2018. ^ Cruzata, Enrique. "Récords Individuales NFL". nfl2016.cubava.cu (in Spanish). Retrieved March 2, 2018. ^ Les Carpenter (December 9, 2012). "Hobbled Redskins rookie Robert Griffin III may not be invincible after all – Yahoo! Sports". ^ a b "Kirk Cousins rallies Redskins after Robert Griffin III knee injury". ESPN.com. December 9, 2012. ^ "Baltimore Ravens at Washington Redskins - December 9th, 2012". Pro-Football-Reference.com. Retrieved March 2, 2018. ^ Jones, Mike (December 10, 2012). "Shanahan: Robert Griffin III has 'mild LCL' sprain". WashingtonPost.com. ^ Hanzus, Dan (December 15, 2012). "RG3 will not start for Washington Redskins on Sunday". NFL.com. ^ Klemko, Robert (January 6, 2013). "Dr. James Andrews says he never cleared Robert Griffin III to go back into game after injury". USA Today. ^ Borden, Sam (January 6, 2013). "Griffin Injured as Redskins Fall to Seahawks". The New York Times. ^ Maske, Mark. "Robert Griffin III's surgery is over". Washington Post. Retrieved January 9, 2013. ^ "2012 Washington Redskins Statistics & Players". Pro-Football-Reference.com. Retrieved March 2, 2018. ^ "Washington Redskins Team Encyclopedia". Pro-Football-Reference.com. Retrieved March 2, 2018. ^ Maske, Mark. "Robert Griffin III, Trent Williams, Lorenzo Alexander selected to NFC Pro Bowl team". Washingtonpost.com. Retrieved May 11, 2013. ^ "Drew Brees replacing injured RG3 on NFC's Pro Bowl roster". National Football League. January 9, 2013. ^ "GRIFFIN BEATS OUT LUCK, WILSON". Associated Press. Retrieved February 3, 2013. ^ Tinsman, Brian (September 10, 2013). "Griffin III: No Finger-Pointing In Locker Room". Redskins.com. Archived from the original on March 3, 2018. Retrieved November 11, 2013. ^ Tinsman, Brian (October 21, 2013). "Redskins-Bears Monday Stats Pack". Redskins.com. Archived from the original on March 3, 2018. Retrieved November 11, 2013. ^ Czarda, Stephen (October 21, 2013). "Robinson Takes The Top Off Bears Defense". Redskins.com. Archived from the original on March 3, 2018. Retrieved November 11, 2013. ^ Corbett, Jim (November 26, 2013). "Questions mount for RG3, Redskins after loss to 49ers". USAToday.com. Retrieved November 28, 2013. ^ Maske, Mark & Jones, Mike (December 12, 2013). "Robert Griffin III shut down for rest of season; Washington Redskins will start Kirk Cousins on Sunday". The Washington Post. Retrieved December 12, 2013. ^ "Robert Griffin 2013 Game Log". Pro-Football-Reference.com. Retrieved March 2, 2018. ^ Mihoces, Gary (September 14, 2014). "Redskins lose Robert Griffin III, DeSean Jackson to injuries". USA TODAY. Retrieved September 14, 2014. ^ Comcast Sports Net (October 29, 2014). "Report: RG3 set to return for Vikings game". Comcast Sports Net Washington. Retrieved October 30, 2014. ^ "2014 Washington Redskins Statistics & Players". Pro-Football-Reference.com. Retrieved March 2, 2018. ^ "Washington Redskins at New York Giants - December 14th, 2014". Pro-Football-Reference.com. Retrieved March 2, 2018. ^ "Philadelphia Eagles at Washington Redskins - December 20th, 2014". Pro-Football-Reference.com. Retrieved March 2, 2018. ^ "Dallas Cowboys at Washington Redskins - December 28th, 2014". Pro-Football-Reference.com. Retrieved March 2, 2018. ^ "2014 NFL Standings & Team Stats". Pro-Football-Reference.com. Retrieved January 24, 2019. ^ Patra, Kevin. "Jay Gruden: Kirk Cousins is Redskins starter for 2015". NFL.com. Retrieved March 2, 2018. 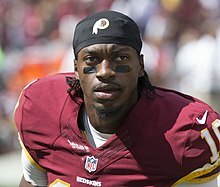 ^ "Report: RG3 ran scout team at Redskins practice … as a safety". Yahoo! Sports. September 13, 2015. Retrieved September 16, 2015. ^ Stites, Adam. "Cowboys, Eagles among possible landing spots for Robert Griffin III in 2016," SB Nation (December 20, 2015). ^ "Washington Redskins release quarterback Robert Griffin III". Las Vegas Review-Journal. March 7, 2016. Retrieved March 7, 2016. ^ Jones, Mike (March 7, 2016). "Redskins release Robert Griffin III, ending dramatic rise-and-fall tenure". The Washington Post. Retrieved March 7, 2016. ^ The Associated Press (March 24, 2016). "Browns Giving Robert Griffin III a Fresh Start". The New York Times. Retrieved March 24, 2016. ^ Sessler, Marc (March 24, 2016). "Hue Jackson: Robert Griffin III a 'tremendous talent'". NFL.com. Retrieved March 24, 2016. ^ Orr, Conor (August 8, 2016). "Cleveland Browns name Robert Griffin III starting QB". nfl.com. Retrieved December 26, 2016. ^ Jackson, Zac (September 12, 2016). "Browns place RG3 on injured reserve". profootballtalk.nbcsports.com. Retrieved September 12, 2016. ^ "Browns activate QB Robert Griffin III". ClevelandBrowns.com. December 9, 2016. Archived from the original on October 26, 2017. ^ "Robert Griffin III". nfl.com. Retrieved December 26, 2016. ^ Patra, Kevin (April 4, 2018). "Robert Griffin III, Ravens agree on one-year contract". NFL.com. ^ "Robert Griffin III wins Ravens' backup job, Lamar Jackson will be team's third QB". CBSSports.com. Retrieved November 9, 2018. ^ "Robert Griffin 2018 Game Log". Pro-Football-Reference.com. Retrieved January 24, 2019. ^ Patra, Kevin (March 21, 2019). "Ravens re-sign QB Robert Griffin III to back up Jackson". NFL.com. ^ "UNFORG3TTABLE". Baylor Magazine. December 12, 2011. ^ Kogod, Sarah (May 10, 2013). "RGIII and Rebecca Liddicoat wedding is July 6, according to registry". The Washington Post. ^ Payne, Marissa (May 21, 2015). "Robert Griffin III debuts new daughter on Twitter, along with her own hashtag". The Washington Post. ^ Cabot, Mary Kay (August 16, 2016). "Browns' Robert Griffin III in the process of filing for divorce". Cleveland.com. ^ Breech, John (August 26, 2016). "LOOK: RG3 shows off his new girlfriend at Browns practice in Tampa". CBS Sports. Retrieved December 19, 2017. ^ Hailey, Peter (May 14, 2017). "Robert Griffin III and Grete Sadeiko are engaged, expecting child together". NBC Sports. Retrieved December 19, 2017. ^ Kimble, Lindsay (July 5, 2017). "Robert Griffin III Welcomes Daughter Gloria". People. ^ Polus, Sarah (July 4, 2017). "It's a baby girl for Robert Griffin III and fiancee Grete Sadeiko". The Washington Post. Retrieved December 19, 2017. ^ "Robert Griffin III and Wife Play Volleyball in Miami After Getting Married". TMZ Sports. March 12, 2018. Retrieved March 13, 2018. ^ Patra, Kevin (November 21, 2012). 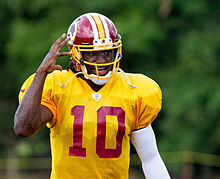 "RG3 ready for big homecoming vs. Dallas Cowboys". NFL. ^ Menzie, Nicola (August 14, 2013). "GQ Cover Story Plays on Religion, But Skims Over RG3's 'Private' Faith?". Christian Post. ^ "Robert Griffin III: 'My Relationship With God is My Most Important Influence'". Black Christian News. May 14, 2012. Archived from the original on September 29, 2016. Retrieved December 20, 2012. ^ Rovell, Darren (August 25, 2012). "RG3 surpasses Luck in early endorsements". ESPN. Retrieved August 27, 2012. 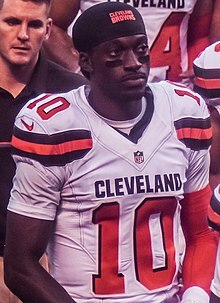 Wikimedia Commons has media related to Robert Griffin III. This page was last edited on 11 April 2019, at 16:02 (UTC).